Take 1 softgel every other day with a meal or as directed by your qualified healthcare professional. 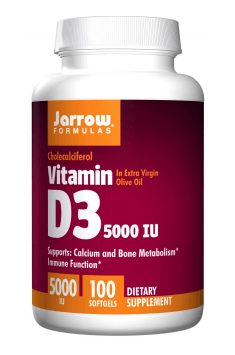 The supplement provides as much as 5000IU of vitamin D in each capsule, therefore during its application, the level of a metabolite 25(OH)D in blood should be constantly monitored. Vitamin D belongs to the group of vitamins soluble in fats, therefore the supplement should be taken with meals containing lipids. Vitamin D and vitamin K work synergistically, therefore it is worth considering the application of the supplement containing vitamin K along with this preparation. Supplement with nootropic qualities. It has relaxing effect and stabilizes mood.